On 7/1/2018 12:32 PM, Norm wrote: http://www.teslasources.com/hv.html Good concept on radiant energy! William Lyne published a workbook of experiments by Tesla in which there is a complete explanation of the disruptive transformer and the magnetic horn discharge gap which gave the unidirectional pulse train. I built the disruptive transformer etc. and was able to get the silver white arc described as the Tesla radiant effect. Mick! I read questions like this and think ,Why cannot you guys grasp the concept of a magnetic diode. Tesla Patented the concept in the late 1800s to rectify AC into DC for the street lights. Again the concept is detailed on page 25 of Colorado Springs Notes. A very powerful magnetic horn spark gap will give you a unidirectional pulse (DC) with absolutely no ring or oscillations due to the magnetic diode configuration (Proven). In effect you are launching a very powerful longitudinal pulse of power necessary to get the Tesla aetheric fire (silver white brush type of arc). I do not know what you do not understand here! Oh! BTW, In the article below regarding the Tesla Death Ray, he goes into detail as to how to project a stream of hard particles out of an evacuated tube with an open end to the atmosphere while maintaining an almost absolute vacuum. I figured out how to do this by simply reading Margarett Cheney's book, Man Out Of Time. The carbon button lamp experiments lays out exactly how it works. Hard particles, very small, traveling at sub light speeds are highly destructive. There is so much in Tesla writings that go over most heads like a 747 jet at 40,000 ft. Sorry, that is a fact. Two people can read a technical article and only the intuitive mind will see! Tesla's use of mechanical analog to explain electrical circuits really throw most folks for a loop! Mick! My problem here is that we have discussed this subject many times and everyone just goes back to the same old projects and do nothing with the information given. To each his own so to speak. Electronics 101. Tesla Fire, you want to generate a negative plasma at very high voltage via a magnetic spark gap yielding unidirectional DC pulse train with the Tesla recommended rest state of .0062 millisecond between pulses, longitudinal pulses. I had two setups that I used. First was a X-ray oil filled tank power supply, of Israel manufacture which had a tank top that was easily removed to get to the guts. I reversed the full wave bridge (60KV) to give me a negative output at the normal + anode terminal. Positive side of bridge was grounded which gave me the 60KVDC output for negative ion wind generator. I also used this power supply for negative ion heat barrier experiments. The other setup was a 12KV potential transformer and full wave bridge to give me the HVDC potential I needed. Very high voltage negative discharges yield beautiful plasma. I used a mechanical relay (solid state devices cannot survive here) to gate the high voltage DC pulses through the powerful horn spark gal which insured a pure unidirectional longitudinal pulse train with the rest period specified between pulses. I find it very interesting that experiments with negative ion wind have all but disappeared from the internet. The POWERS TO BE know that negative ionization leads to such thing as COUNTERBARRY (anti-gravity) and cooling. Tom Bearden told me a lone time ago back in the early 80s not to even mention this subject cause you will end up a DEAD DUCK. Build your own experimental circuit from this article. I had cases of brand new flyback transformers that I got through salvage. Circuit is duck soup simple. I have an ion wind generator running constantly in my home. "I find it very interesting that experiments with negative ion wind have all but disappeared from the internet." Try another search engine. At least Google has lots of references to that technology: https://www.google.dk/search?q=lifter+ion+thruster Or do I see them only because of living in a country where censorship is illegal with the risk of Mohamed crises etc? By J. David Baxter The following article is based on an article in the Jan./Feb/Mar, published October 12, 1994 issue 13, of Electric Spacecraft Journal, and was compiled and reviewed by editor Charles Yost. Gravity can be regionally modified around an object. The gravity force, on an object, can be modified through the specific use of electromagnetism. A mass is placed in a uniform magnetic field, and exposed to pulsed, high frequency microwaves, specifically tuned. The atoms in the mass, realign their nuclear spin orientations. This directly affects the symmetry of the mass gravity field. The mass can lose or gain weight. The gravitational change occurs during electron/nuclear orientation and disorientation transition. This involves a pulsed dynamic nuclear orientation, with a net magnetic moment. The magnetic field is constant. A greater reduction on Earth’s gravitational reduction, on the mass, occurs with driven orientations. The best element to use is a pure isotope of aluminum. The pulsed electric field, in a constant magnetic field, operates at the Larmor frequency. 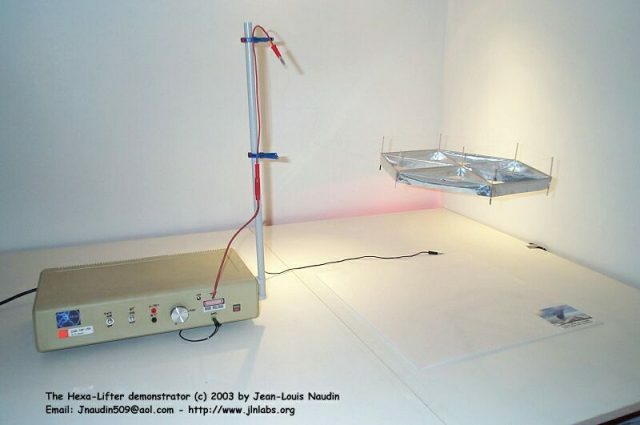 The process involves a microwave source, FM detector, connected to a lock-in amplifier, and a modulation generator. The orientation of the aluminum nuclei has a much longer lifetime then its thermal decay. With the creation-annihilation cloud, generated by the Earth, and disorienting of the mass nuclei, occurs at the expense of the mean disordered motion of this cloud. Too fast a flipping of dynamic nuclear orientation, would increase a gravitational field. Although, in outer space, the field could be coupled, to a distant gravitational source, and used for propulsion. Radiation fluctuates in intensity on a subatomic scale. The observed speed of light is an average of many fluctuation processes. These are random fluctuations. There is no sharp division between field and particle. Matter-energy to one particle is transferred to a second particle. At a fixed magnetic field of 660 Oe, a pulsed oscillation can be applied at 3000 MHz. The pulses of the oscillating field for 2 microseconds, with a duty cycle from 2 to 6 milliseconds. Iron is embedded in the aluminum, and mixed to make it operational at a higher melting temperature. The ratio of iron to aluminum is 1 to 10. There is 6.3 times 10 to the 4th power of Joules of gravitational energy at the Earth’s surface. Substantial gravitational attraction can be removed in several seconds. "The process involves a microwave source, FM detector, connected to a lock-in amplifier, and a modulation generator." Have you study Nikola Tesla's work with High Frequency? Once upon time I had a book about free energy and new tesla secondary coils. They were long tubes without windings and I don't know how much power is needed at 3000 Mhz for decrasing or increasing gravity? Google: 3000MHz microwave and find a 3 watt class C amplifer. It is hot in Sweden and I have nothing else to do then reading books, read and write on the Internet and finally do some solid state free energy experiments. Best read David Alzofon's book. The ones you quote are attempting to produce an antigravity force, and have been around a long time without anything unexplainable happening. The Alzofon Drive controls gravity, which reduces both inertia and gravitational attraction to zero. It may even be crazy enough to be true. I've already got the software-defined radio transmitter that gives me up to 6GHz with an accuracy of around 0.1ppm, and amplifiers up to 2W. Should be enough. The difficult thing is making the material needed, but the initial experiment was done using powdered metal in a resin binder. I think that would deteriorate pretty quickly because the resin would be permeable, but it would be OK for a few weeks. You can probably find a coil for the magnetic field needed, so this is actually something you could try yourself. You'd also need a waveguide, but that's simply a bit of tube. The information is there, and it's been ignored for a long time. This is something inherently different than other people have done, so at least it has a chance of working. The projects you list have been tried by many people and, though you can get a lifter working, it won't work in space and isn't antigravity or gravity control. Needs too much power, too. I can't guarantee that the Alzofon Drive will work or that the theory is near-enough right, but it seems a far better bet than anything else I've seen.